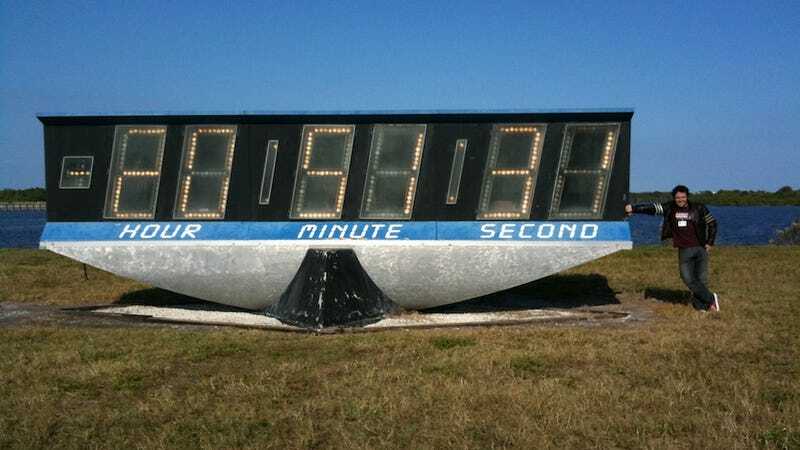 If you're a space nerd like me, you probably knew that the iconic countdown clock at the Kennedy Space Center was big. Yesterday—on my first day covering Discovery's Wednesday launch—I learnt it wasn't big. This thing is humongous. The digital countdown clock—which uses large, old school incandescent light bulbs to shape its numbers—actually looks quite battered in person. It doesn't surprise me. It has been working since the days of the Apollo program. It's located at the Launch Complex 39 Press Site, where journalists have been following manned launches since Apollo 8, in 1968. The Space Shuttle Discovery is scheduled to launch on mission STS-133 at 3:52PM this Wednesday, carrying the Permanent Multipurpose Module Leonardo and Robonaut to the International Space Station.